Vampire Boy: The Adventures of Alex Vambarey by Aric Cushing is a stellar fantasy that will thrill the hearts of many young readers, a story that begins in the midst of action. Like many other kids in the Carpathian Academy, Alex Vambarey is working hard to figure out what the Magus riddle signifies, and this will lead him to great adventures and stunning discoveries. Can Alex, barely in his first year, figure it out? Readers are introduced to intriguing characters, vampires and weird creatures, and it is more exciting to discover these creatures together with the protagonist. 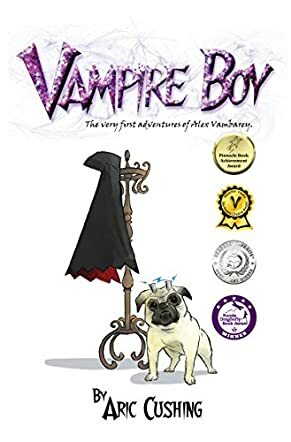 Vampire Boy: The Adventures of Alex Vambarey is a masterpiece, a story written for young readers, but with the power to enthrall adult readers too. Things of beauty are hard to describe, and this story is one of those things. They are better experienced. The fast-paced plot, the well-developed characters, the suspense, and the humor, are just a few of the powerful signatures of the author. This is the best children’s book I have read in years after Rick Riordan. Vampire Boy: The Adventures of Alex Vambarey is an adventure fantasy novel for preteens written by Aric Cushing. Alex was born with white hair. This was an unusual and most auspicious occurrence, and his mother, Cassandra Vambarey, fondly looked at her new son, with that white hair and his blue eyes, and committed his features to memory. She knew that the prophecies spoke of a boy with white hair; she also knew that at any moment she might have to leave baby Alex in the hands of others. Hillock Green, the small town where the Vambareys and their vampire neighbors lived, was generally a quiet and peaceful place to live and raise children, but Deleter was approaching as Alex's father, John, and the rest of the leaders of the village watched in dismay. Deleter was a towering figure draped in a voluminous cloak and, as he strode towards them, the grass crushed by his feet began to burn. When he reached them, Deleter asked for the child, but John and the others were determined to protect him. Deleter removed his hood and stood, humorously surveying their shocked expressions, as they beheld his altered features. He had become a demon; two black horns grew out of the sides of his skull. Deleter swore that, though they might have succeeded in forestalling the event, he would have that boy. Aric Cushing's adventure fantasy novel for preteens, Vampire Boy: The Adventures of Alex Vambarey, is an exciting and well-written book about Carpathia, a world that's just a bit different than ours, or even that of Rowling’s Harry Potter. Vampires, gargoyles, druids, pixies and elementals co-exist and, when the time comes, send their young boys and girls to the Carpathian Academy, where they will learn both traditional and special topics. There are different class groupings called wings that the students are divided into, and each wing competes in school-wide contests for the solution of the Magus Riddle. Readers who have read each of the Harry Potter books at least once will find themselves comparing the Carpathian Academy and Hogwarts in their minds. There are some intriguing and entertaining parallels, for example, the Whomping Willow's alter ego is a Whining Tree that one must pass before setting off on the Giant’s Train, but Vampire Boy is a fresh and original story that works quite well on its own. Cushing's storyline has epic undertones, and his characters are fun to follow as they work to solve the riddle and survive the perils confronting them at the Carpathian Academy. Vampire Boy: The Adventures of Alex Vambarey is highly recommended. Vampire Boy by Aric Flushing is a delightful children's novel. The vampires' world is threatened by the evil Deleter. Their hope rests on the birth of a white-haired vampire boy, Alex. When he comes of age, Alex goes to school with the instruction from his father to make friends with everyone. Among his new friends are a wizard, a gargoyle, a pixie, and a druid. Alex thought the biggest challenge in his life would be finding clues to the Night Gallery, until he realizes his dreams of being a hero aren't as far off as he thinks. With the threat of the evil vampire Deleter looming, and a secret his parents are keeping from him, Alex learns the significance of his white hair. This novel made me reminiscence about the Halloween movies - The Littlest Vampire, Casper Meets Wendy, and Halloweentown - that I watched as a child. The novel has a lot of different humor, from vampire puns and Alex in his pumpkin pajamas climbing into his coffin to the human jokes, monsters kept in garages and drinking gas. Vampire Boy is more than humor. It's a tale of friendship. Alex is told by his father to be friends with everyone. So he befriends wizards, a pixie, a gargoyle, and others. It's easy to take these supernatural types and fill in the blank. The novel teaches one to honor each other's differences and to seek to be friends with all sorts of people. It's a lesson, but it doesn't read like one. Vampire Boy is funny, charming, and delightful. Perfect for children, but adults can enjoy the wit and the charm.